Summer is finally in full swing here in Vermont, and with summer weather comes a distaste for having to do anything with your hair in the morning. Below are three very simple , user friendly hair styles that are heat free. So there will be no need to stand in your bathroom with a curling iron & feel like you are baking in an over. 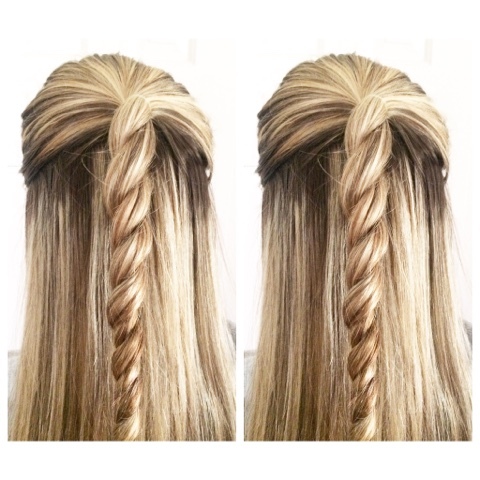 All three of these cute summer hairstyles will take under 5 minutes! 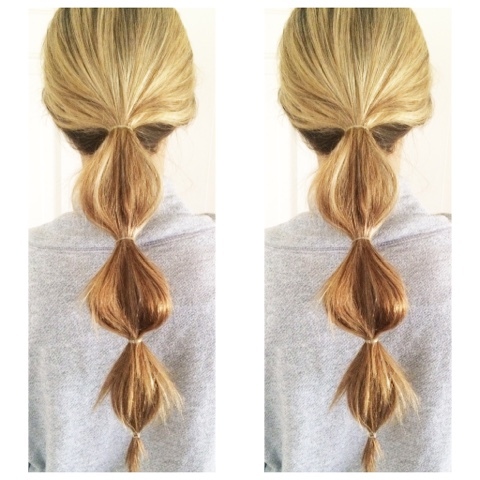 I love this hairstyle for summer because it's super easy & keeps your hair off of you. This bubble pony tail just kicks a normal pony up a few notches & looks like you put effort into your hair, when really it only took a few minutes. To achieve this look first spray your hair with a thickening/ texturizing spray, after that gather your hair into a pony and secure it, next go down about 2 inches and secure another elastic, at this point pull apart the distance between the two elastics to create a bubble effect, if your hair is thinner you can tease the hair before securing the second elastic to help bulk the hair up & have it look fuller. Continue this process until you have reached the bottom of your hair. Using elastics that are thin & close to your hair color will help to keep this look fresh and clean, using a bulky hair-tie could distract from the look of the 'bubbles'. This hairstyle reminds me of those long rainbow lollipops I used to beg my mom for as a kid. To achieve this look just section of the top half of your hair, starting at the crown down to the top of your ear. After you've section this off secure it in an elastic. Next split the section of hair in the elastic into two sections and 'twist' them together, make sure to twist them as tight as possible as it will loosen once you tie it off. Twist the hair until you reach the bottom and tie it off with an elastic. This style looks best when the hair is shiny & tamed so I suggest using a serum on your hair first and finishing it off with some hairspray. 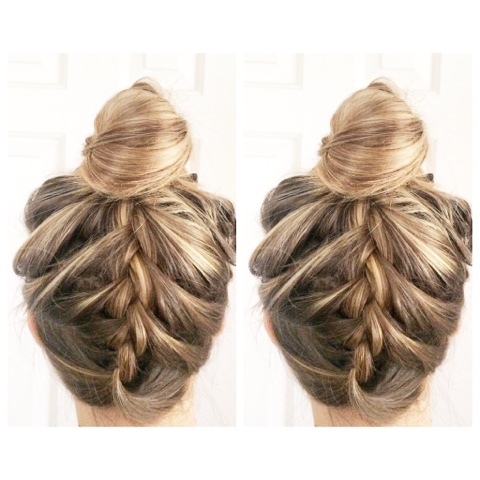 This hairstyle takes a top knot to a whole other level. To achieve this look just flip your head upside down and french braid your hair from the nape of your neck to the top of your head. When you've finished the braid tie it off with a small elastic and flip your head back over. To finish this look off just tie your hair up into a bun. This look isn't meant to be perfect so don't worry if your braid or bun aren't 100%, this is supposed to look a little messy. P.S. No my hair didn't grow 10 inches overnight & turn blonde! Thanks to my friend for letting me borrow her head for this post! That`s really easy! Thanks for sharing these simple ideas! I`ve already tried the first one. It really took less than 5 minutes. I like wearing easy and beautiful hairstyles that help me look attractive and self-confident.